This MP3 file is from the album The string quartets. Vol. 1 / Peter Sculthorpe. Duration: 6 mins, 36 sec. Score: Small town : for string quartet / Peter Sculthorpe ; arranged by David Matthews. 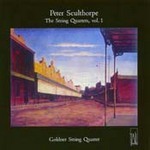 Parts: Small town : for string quartet / Peter Sculthorpe ; arranged by David Matthews. CD: The string quartets. Vol. 1 / Peter Sculthorpe.